Joseph, son of Jacob from the book of Genesis, is one of my favorite people in the Bible. He was the next-to-youngest of the twelve sons of Jacob. Jacob had four wives, but only one true love. That was Rachel, who was Joseph’s mother. It was undoubtedly Jacob’s love for Rachel that caused her son Joseph to be his favorite of his twelve sons. This blatant favoritism caused Joseph’s ten older brothers to despise him. His father treated him to a coat that was the envy of the whole family. “Why just him and not us?” And Joseph had dreams in which all of his brothers and even his parents would one day bow down to him. He was foolish enough to tell his brothers about those dreams. They already hated him. Why did he have to give them more fuel for the fire? His brothers wanted him dead, but then his brother Judah (the head of the tribe that Jesus is descended from) found a way to profit from Joseph’s demise. Instead of outright killing him, they could sell him into slavery and split the money between them. Yeah, that’s the ticket! The book of Genesis has 50 chapters and Joseph is the star of the show in 14 of them. Although his life is scrutinized in Scripture, nowhere does it say anything negative about him. He is presented as a man of sterling character in the face of some unimaginably difficult circumstances, a man who flourishes in every setting, borne along by an unshakable faith in God. Joseph is cherished by his father, but despised by his older brothers. He is sold into slavery and manages his master Potiphar’s house brilliantly until he is falsely accused by Potiphar’s wife as her revenge for his refusal to commit adultery with her. He is thrown into prison where he is once again blessed by God with success at everything he does, leading to his promotion to Head Trustee. In that capacity, he meets two high officials of Pharaoh’s court who have been imprisoned with him. Through his gift of dream interpretation, Joseph correctly foretells the fate of both prisoners, but is promptly forgotten by the one who is released. Two years later, Pharaoh has two troubling dreams that no one can tell him the meaning of. Then his jailbird cupbearer remembers Joseph, the Hebrew trustee who interpreted both his and royal baker’s dreams, and both came out exactly as he had said. After years steadfast service to God through slavery, false accusation, imprisonment, and abandonment, Joseph is summoned from the dungeon to stand before the most powerful man on earth and interpret dreams that no one else could decipher. Humbly giving all credit to God for what he is about to reveal, Joseph tells Pharaoh the ultimate good news / bad news story. The good news is that the nation of Egypt is about to begin seven years of record-shattering productivity. There will be bumper crops like have never been seen before and prosperity will saturate the land. The bad news is that those seven years will be followed by seven years of famine that will be so severe that no one will remember the good times that preceded them. Prosperity will be swallowed up by abject poverty. Wow. Bummer. So what do we do? What you need to do is not blow it all as fast as it comes in. You can still live well during the good times while you sock away provisions for the hard times to come. God will bless you with enough now to carry you through the famine, but only if you manage it properly. Only if you save it and store it and preserve it and show some foresight and restraint. You’ll be OK if you plan ahead and live below your means today so that you can meet your needs tomorrow. Noah was the first of the Genesis Preppers that we looked at. Except for liking animals a lot, I’m not much like Noah. Noah was a guy who was good at working with his hands. He built a monster of a ship. For all I can tell, it might have been the first ship of all time, and it was a doozy. He was a real survivalist. He stepped off his ship onto an empty planet and had the skills to begin rebuilding the world. Me? I get confused about which end of a hammer you’re supposed to hold onto. But then I look at Joseph. He was an interpreter of dreams. Like the others, this isn’t a skill that I possess, but I see that it was something that God placed in him and something that he used for the glory of God and the good of mankind. If I just focus on those things, I’ll be OK. And so will you. I believe that preparing for the future, come what may, is both wise and biblical. In the days to come, we will launch a series of blog posts that we call Proverbs for Preppers which highlight Scripture’s teaching on making yourself ready for a variety of future events, but today we want to turn our attention to a great role model for preparedness from the book of Genesis — Noah. Can you say TEOTWAWKI? (The End Of The World As We Know It.) Noah had to pack away enough stuff to prepare for starting civilization from scratch. Many Bible scholars believe that it had never rained on the earth prior to the Flood. Genesis 2:6 talks about how water came out of the ground to water the plants on the surface of the land. 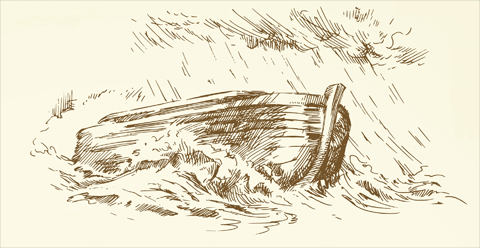 Noah was preparing for rain (and lots of it) at a time when rain had never happened. Is it any wonder that his neighbors considered him to be a mad man? So it is with many of us who prepare for future calamities, especially unprecedented ones. Note that while God revealed His plans to Noah and instructed him to prepare for disaster, God didn’t do the work for him. Noah had to build the ark. Noah had to gather and store the food. Did God take care of him? You bet He did! But God didn’t hand it all to him on a silver platter. Noah had to do the work himself. And so it is with us today. God reveals Himself to us. He reveals His plans to us. He gives us impressions and convictions from the circumstances that surround us. And then we have to do the work. We pray and seek God through the whole process, but we work while we pray. We’re like Nehemiah’s construction crew, rebuilding the walls of Jerusalem to prepare for the Israelites to return from the Babylonian captivity. They worked with a trowel in one hand and a sword in the other hand. They prayed and they took action. They had faith in God to protect them and they armed themselves for war. There are many Christians who don’t prepare, but instead look to their faith in God to provide for them. Noah had more faith in God than anyone in his time, and his faith was proven by his actions. God was calling Noah to take action. If he had refused to do so and simply relied on God to “take care of him,” it would have been disobedience and sin. God hasn’t spoken directly to me as He did to Noah, but I believe that God is prompting me through my observation of the signs of the times (Matt. 16:2-3) to get prepared. Since you’re reading this, I suspect that you might be in the same boat as me, or at least beginning to consider it. My prayer for you is the same as it is for myself: that you would hear God clearly, that you would take appropriate action at the appropriate time, that you would be thoroughly equipped and trained to be able to thrive through any difficult circumstances that may come your way, and that out of the abundance of God’s provision and your faithful stewardship that you would be able to meet the needs of your family and to be a blessing to many others.